Today I got a challenge from Lewis Richards (@Stroker on Twitter) – A selfie with a Raspberry PI Laptop that I have built. Okay – Challenge accepted. Turning a Raspberry PI into a laptop is not a new thing but does look like an interesting project to undertake. If you don’t want to build your own you could buy a Raspberry PI-Top and use this pre-built case to save a build. Awesome DIY Raspberry Pi Laptop http://flip.it/QqZz8N @Max_Hemingway I want to see a selfie of you with one of these you’ve built! However my challenge is to build one so I am currently working through the best way to do this and what functions and features I want to build in. I’m more into an external mouse but happy to include a form of track pad. Thinking about what else I can get into the device to add functionality and would welcome any suggestions to add to the device. I will blog more parts to this build as I go through the design,build and get the relevant parts together. The options available to consume voice activated assistants are increasing with recent releases within the market. The availability of pre-built off the shelf Assistants is growing and so is the ability to build your own using the open sourced versions. This aside whilst we await the release of the sale kit for AIY, you can still take advantage of the AIY capabilities and a Raspberry Pi 3 in a similar way to installing Amazon Alexa onto the PI. Its good to see that GitHub has now provided a toolbar to aid in formatting Markdown. This will help some users from using HTML code format to a word processor GUI type experience. It should appeal to those who are starting out on their coding journey or want an easier life not having to remember if they have included all the <> and </> commands in their files. “Manual tasks of today should be the Automated tasks of tomorrow”. There are lots of Automation tools available to people and businesses today to automate tasks that are carried out in a manual way. The pace at which this is happening is varying based on Habits and Patterns that we use on a daily basis. Also because change is involved which sometimes causes its own set of anxieties and issues. Back in 2012 Bruno Oliveir published a graph on G+ on Geeks and repetitive tasks, which, shows a view of time vs task and how as geek vs non geek might approach automation. An alternative view was published by Jon Udell in 2012 – Another way to think about geeks and repetitive tasks which shows an alternative view adding in more steps to show repetition. 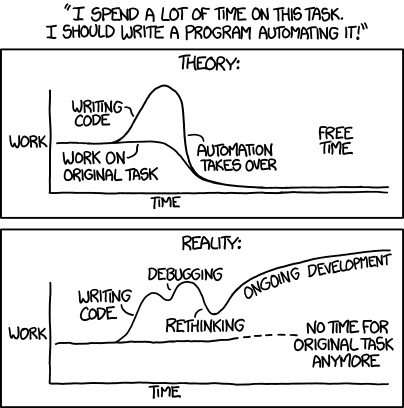 xkcd has an interesting view on the subject that does ring true in some cases where something does not exist and needs to be created in order to Automate. You need to be careful that in spending lots of time in trying to automate a task, that you don’t may spend more time in developing automation than could have been spent actually doing the task. To get over this an element that is missing from these graphs is reuse and blueprints/patterns. The chances are that someone else has had a go at doing what your about to automate so there may be something to reuse rather than developing something yourself. There are lots of tools and code repositories available today with more being developed. It will depend upon what you are automating as what to use. There are too many to list – lots of others available. Using an Agile approach as well may reduce the length of the task size line on the graph as you do not need to boil the ocean to automate. Break up tasks into their components and you may find it easier to automate. These tools are also bringing the geek and non geek lines together as Application’s and API’s make it easier for automation to be implemented. The plot of the graph changes into a repeatable process and in effect becomes a loop for both the geeks and non geeks. So what will you automate today?